BMPT Terminator being showcased at an expo. 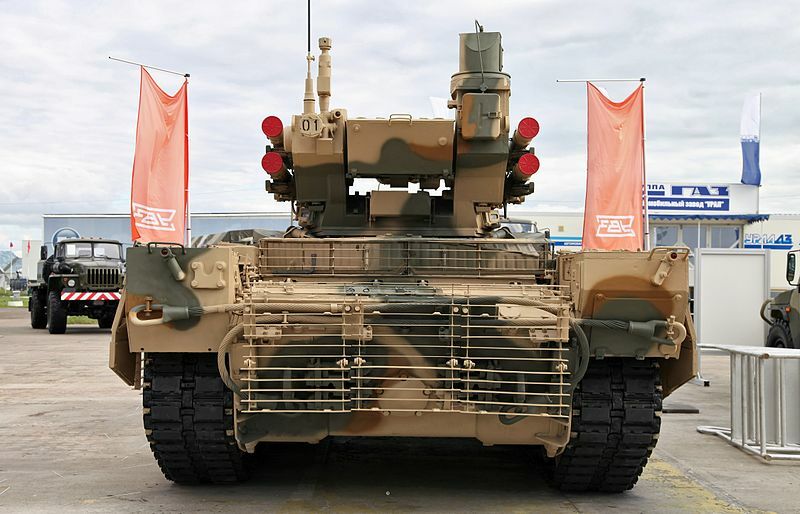 The BMPT Terminator (the name “Terminator” is not an official designation, but used by the designers for publicity reasons) is a support combat vehicle which is mainly meant to be used in urban areas. It is, quite obviously, based off the T-72 without the iconic hemispherical turret, which is exchanged for an unmanned platform with a single machine gun, four anti-tank missiles and dual 30 mm (1.18 in) auto-cannons. The hull has a superstructure built onto to it, which allows for more space for the crew. Since tanks aren’t really suited for use in urban areas, this is a great alternative to the regular MBT, because it possesses a rapid enough rate of fire to react to any enemy vehicles in its surrounding and the four missiles are excellent when fighting against heavily armored targets. However, this vehicle is not a tank substitute, as it cannot perform as well in non-urban areas. While it is still lethal against other softer targets, it is unsuited to the extreme ranges that tanks battle at. Another advantage that the BMPT has over regular tanks is the elevation and depression. The gun is able to elevate and depress enough to hit at any targets, like building tops and other tall structures. Before the Terminator, two earlier prototypes were placed in competition for the BMPT requirements. These were the Object 781 and the Object 782, both made by Chelyabinsk and lead by V.L. Vershinsky. 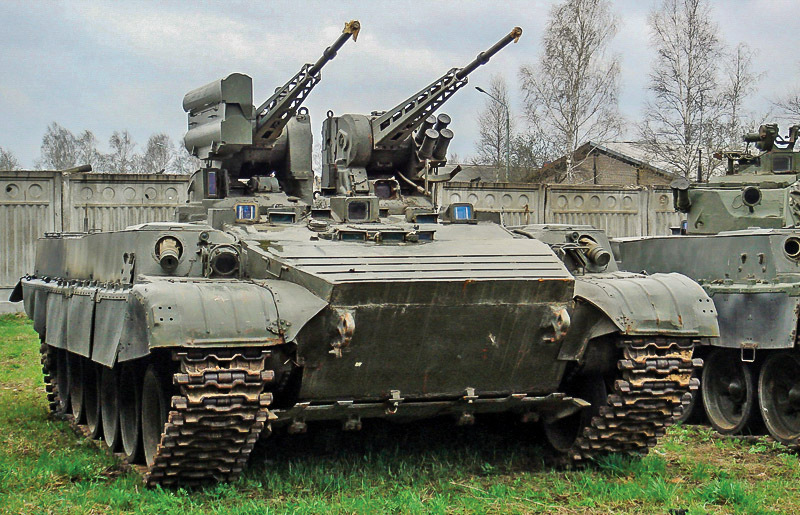 The main reason these two vehicles were ordered was the performance of IFVs in the Soviet War in Afghanistan. IFVs such as the BMP-1 and the BMD series proved to struggle against infantry when faced with portable anti-tank weapons, such as the well-known RPG series. Another downfall of the BMP-1 was the lack of elevation (the BMP-2 fixed this problem) which allowed the enemy to take a major advantage when engaging it from above. 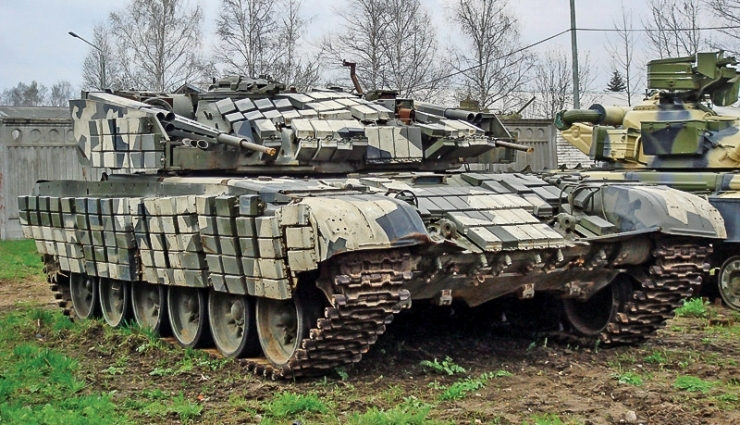 The Object 781 and the Object 782 were based off the T-72B, with major modifications. The Object 781 was dual turreted, each turret having a 30mm 2A72 (basically a simpler 30mm 2A42, which is seen on Soviet/Russian helicopters and IFVs) with a PKT 7.62mm machine gun as a companion. It also mounted an anti-tank missile system of an unknown type (most likely the 9M133 Konkurs). Its competitor was the Object 782; it had an actual turret, as opposed to the two unmanned turrets of the Object 781, with a very similar hull. 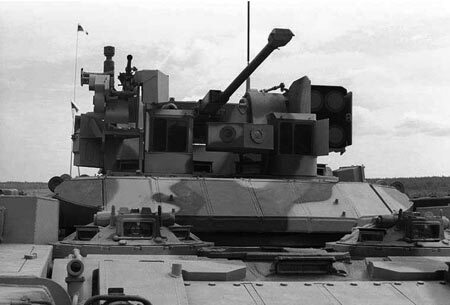 The profile was smaller and it was armed with a 100mm 2A70 low recoil gun and a 30mm 2A72 auto-cannon which were directly connected to each other (similar system and weapons on the BMP-3). It was also armed with two 40mm grenade launchers (one on the hull and the other on the turret). The Object 781 won and was probably considered for mass-production, but the break-up of the Soviet Union ruined that prospect. 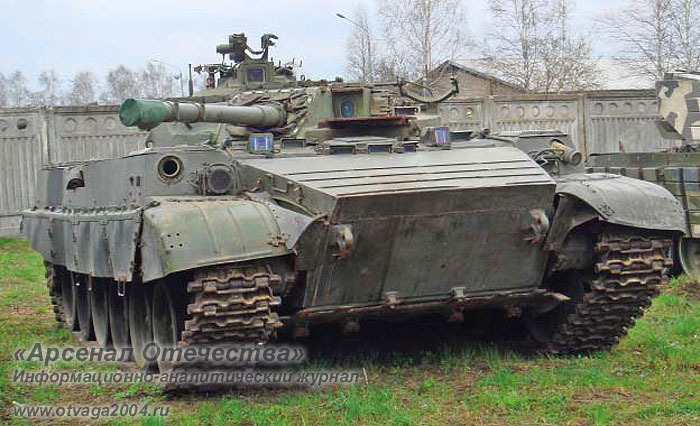 About five years later, another prototype was made and built by Chelyabinsk; this prototype was based off the T-72AV. 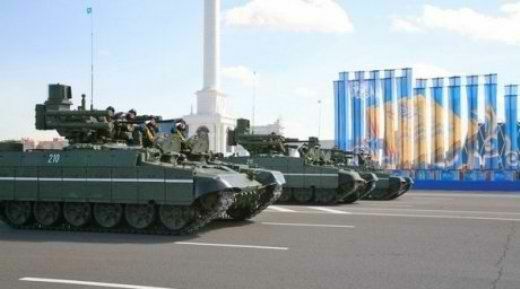 This project was built because of tank performance in Chechnya (which was abysmal). The project kept the turret but removed the big 125mm main gun for a pair of 30mm 2A72 auto-cannons and six unguided rockets on each side. It also added extra structure at the back, in order for the armament to work properly and shield it from flanking fire. This tank was praised by many of the designers and some military officials. Unfortunately, work on the project was canceled because it was being advertised on radio and on television. Everyone who was working on the project was accused of “giving away Russia’s secrets” (keep in mind that Russia was in chaos during the 90’s). While they weren’t allowed to work on this vehicle, in particular, this did not stop the urge for an armored fighting vehicle with missiles, auto-cannons, and lots of armor. In the early 2000’s, work started on a new project called the Object 199, with the name “Ramka” attached to it. The Object 199 is the tank that came to be known as the BMPT Terminator. It was shown to the public in 2001 as a mock-up and the real project was unveiled to the masses in 2002. The early design was armed with a single 30mm 2A42 and four 9M133 “Kornet” ATGMs with two AG-17 grenade launchers and one 7.62mm PKTM as secondary armaments. Further development accompanied the 30mm auto-cannon with another 30mm auto-cannon and replaced the 9M133 “Kornet” ATGMs with 9M120 “Ataka” ATGMs. 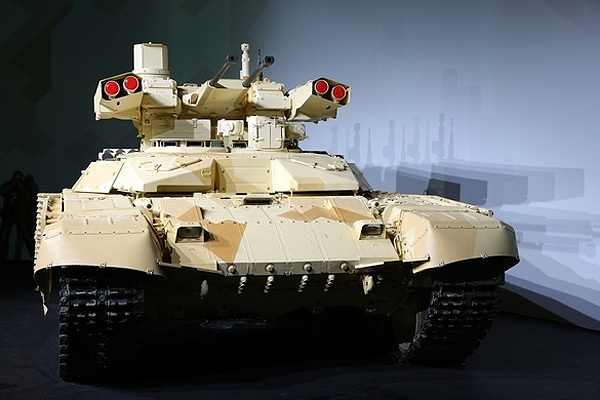 Instead of the 30mm 2A72 seen on the first 3 prototypes, the BMPT was equipped with the more complex 30mm 2A42 autocannon (effective range of 4000 meters). This auto-cannon is stabilized on two planes and has a rate of fire ranging from as low as 200 rounds per minute to 800 rounds per minute, with both having -5° and +45° and 360° of turret rotation. 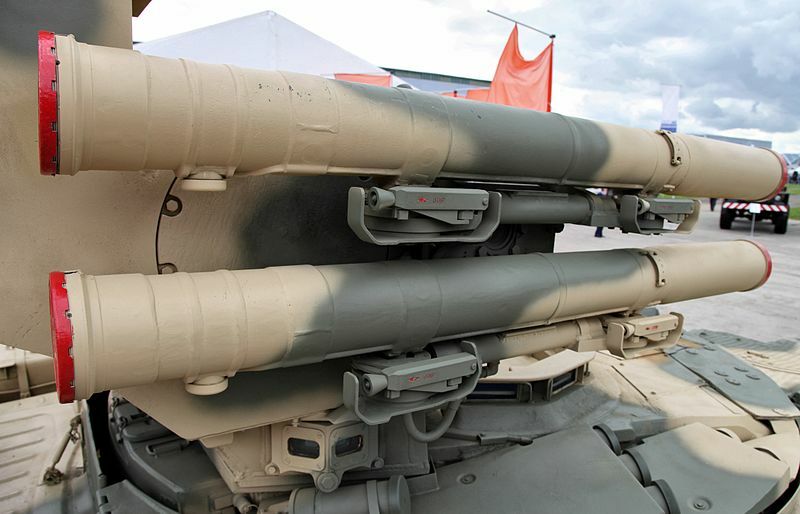 The BMPT’s second primary armament is the 130mm 9M120 “Ataka-T” anti-tank missile (industrial code is B07S1), with claims from the manufacturer that it can penetrate 800 mm (2’7”) of homogeneous armor with ERA with its HEAT ammunition (good enough for the side or rear of any modern tank). There are four of these anti-tank missiles, with two of them being placed vertically on both sides of the 30mm auto-cannons. This anti-tank missile is guided by a semi-automatic laser beam with flexible elevation angles (-10°/+25°). The missile has a flight velocity of 550 m/s with a maximum range of 5800 meters; it is controlled by the VIAM.461112.001 ground control equipment inside the BMPT. Since this is not a 9M120F variant (anti-personnel variant), it does not have the ability to carry anti-personnel missiles or not supposed to. The BMPT is powered by a V-92S2 (2000 rpm, V12, 4-stroke, multi-fuel, liquid cooling, and turbocharger) engine that churns out about 1000 hp. Combined with the weight (48 tonnes, 53 short tons, and 47 long tons) of the BMPT, it has a power-to-weight ratio of 20-21 hp/t, with a range of 550 km and a speed of 60 km/h on hard roads. The gearbox has seven forward gears and one reverse gear. The BMPT’s suspension is a torsion bar suspension (like most tanks designed from the 50’s and onwards) with shock absorbers, six rubber-lined road wheels, one front idler wheel, one rear drive sprocket, and three return rollers on each side. Ground clearance is 406mm and it’s able to ford water as deep as 1.8 meters with preparations and 1.2 meters without preparations. It is also able to climb over obstacles up to 0.85 meters at 30 degrees and able to cross trenches of 2.6-2.8 meters wide. Since the armor is based on the T-72, it will most likely have the same armor as the T-90 or a modernized T-72. It also has Relikt ERA, which is said to be stronger than Kontakt-5. The side skirts are covered with soft material armor, cage/slat armor at the rear, and hard panels made of different materials. The crew is NBC protected from nuclear, biological, or chemical weapons, as the acronym suggests. It also has an automatic fire extinguisher and System 903A smoke grenade launchers to conceal itself when spotted by the enemy or against guided weapons using infrared. 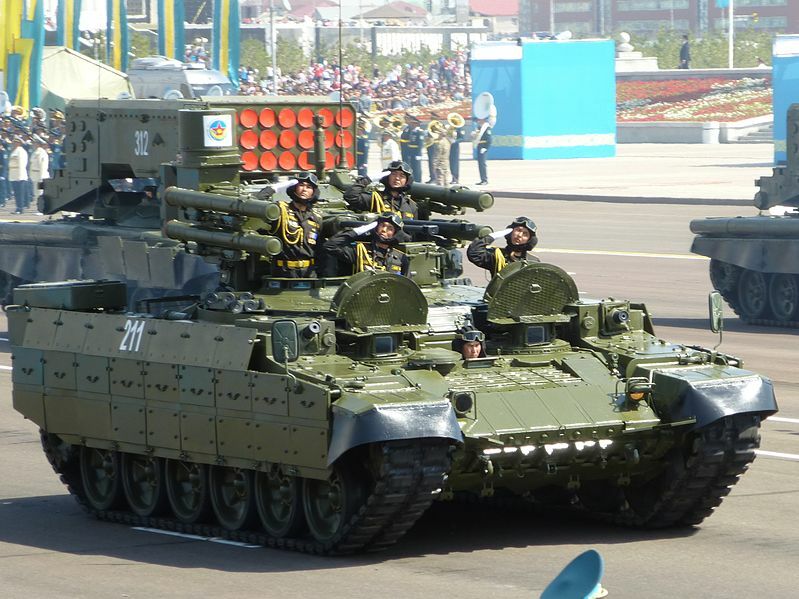 While the BMPT is not in Russian service since it is based on old Soviet tank designs, it is being used and bought by Kazakhstan and Algeria. 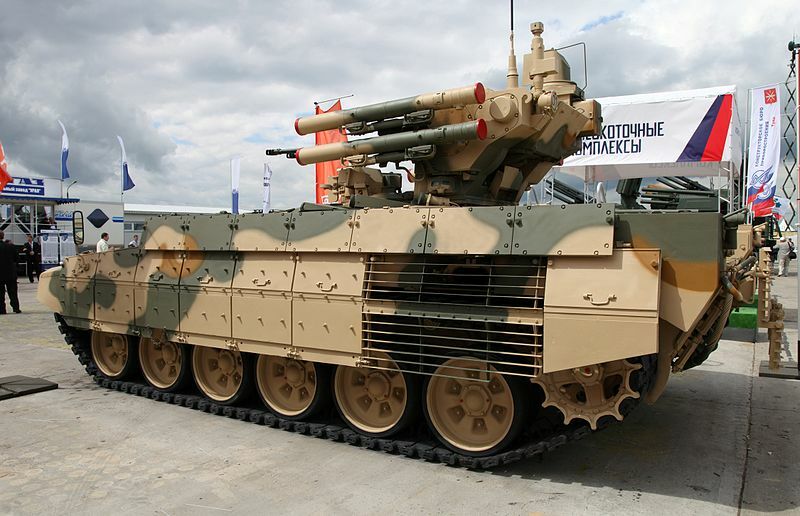 Kazakhstan even went further by signing an agreement with UralVagonZavod in September of 2013 to co-produce the BMPT. Kazakhstan is providing decommissioned T-72s while Russia, specifically UralVagonZavod, will provide modules and spare parts with which Kazakhstan will assemble these tanks in their nation. This is a great way for UralVagonZavod to make a profit and for Kazakhstan to revive their old Soviet-era T-72s to current standards. 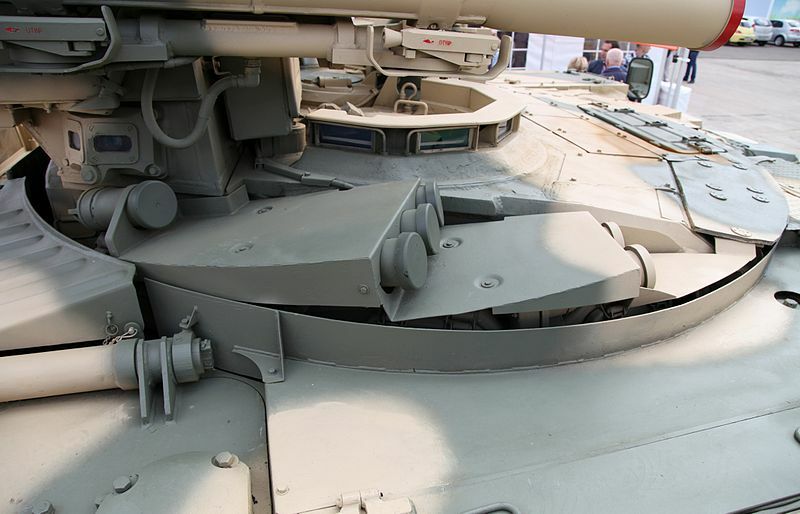 Peru also expressed interest to UralVagonZavod during Peru’s SITDEF (Salón Internacional De Tecnología Para La Defensa Y Prevención De Desastres Naturales) expo in 2015, with an interest to upgrade their aging T-55s with BMPT turrets and other possible modifications to the hull. However, these T-55s may be replaced or at most accompanied by Russian T-90s, Spanish Leopard 2A4s, or Dutch Leopard 2A6s. In addition, various Israeli companies and the Peruvian Desarrollos Industriales Casanave, with the association of the Ukrainian Kharkiv Morozov Machine Building Design Bureau, have also offered upgrades for the Peruvian T-55s. 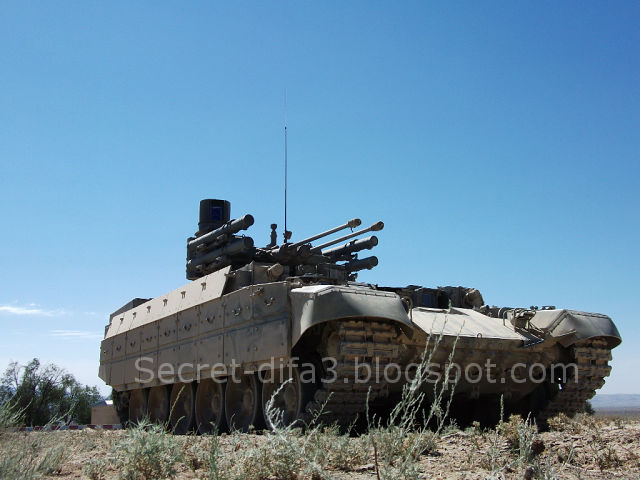 BMPTs in Kazakhstani or Algerian service. 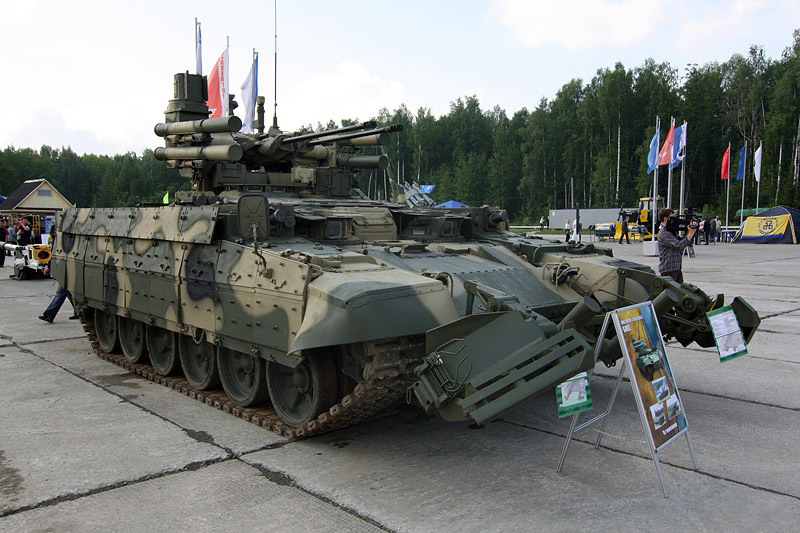 This support combat vehicle was first revealed at the Russian Arms Expo (RAE) at Nizhny Tagil, Russia in 2013. The Terminator 2 is being sold as an armor upgrade package, rather than an actual tank, with two engines available. The two engines are the V-84MS (840 hp, 2000 rpm, V12, 4-stroke, multi-fuel, liquid cooling, and gear driven centrifugal type supercharger) and the V-92S2 (1000 hp, 2000 rpm, V12, 4-stroke, multi-fuel, liquid cooling, and turbocharger). These upgrades removed the two frontal 30mm grenade launchers; this reduced the crew from five to three, but also lightened the load from 48 tonnes to 44 tonnes. 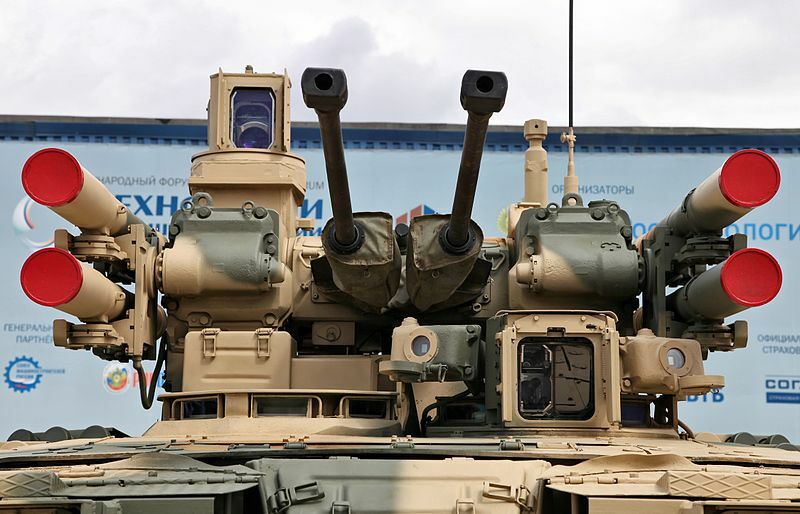 The armament of the BMPT-72 Terminator 2 is the same (except for the removal of the two 30mm grenade launchers), however, the armament is better protected and the structural support of the four ATGMs is enhanced and positioned horizontally instead of vertically. The FCS has also gotten an upgrade with a new multi-channel gunner’s sight that is equipped with a thermal channel, night vision, laser range finder, laser guidance system for missiles, and independent 2-plane stabilization of field of view with a sighting range of 5000 meters. 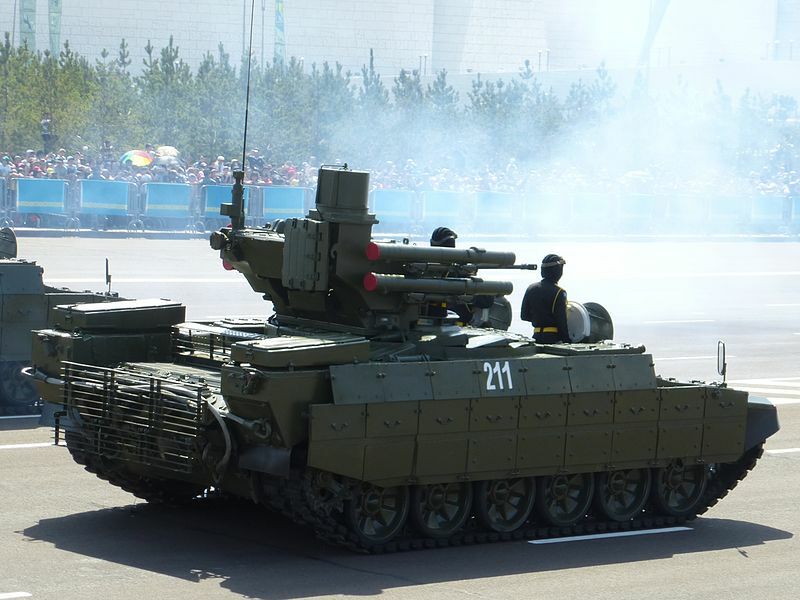 The BMPT-72 received a new digital ballistic computer with weather and topographical support and the armament is stabilized on two axes with electromechanical traversing and elevating drives. Lastly, improved NBC protection is provided for the crew. While the Terminator 2 isn’t in service as far as we know, Azerbaijan held an arms expo named ADEX (Azerbaijan Defense Exhibition) in 2014, which allowed arms dealers to show off their weapons to the armed forces of Azerbaijan. Since Azerbaijan has territorial issues with Armenia about the Nagorno-Karabakh region, the small Caucasian nation is looking for potent weapons in case things get heated again between the two countries. During the expo, Azerbaijan had stated that they’re interested in the Ka-52 attack/scout helicopter and the BMPT-72 Terminator 2 and numerous other weapons. In 2013, various unspecified Persian Gulf nations also expressed interest in the Terminator 2 during the Russian Arms Expo (RAE). 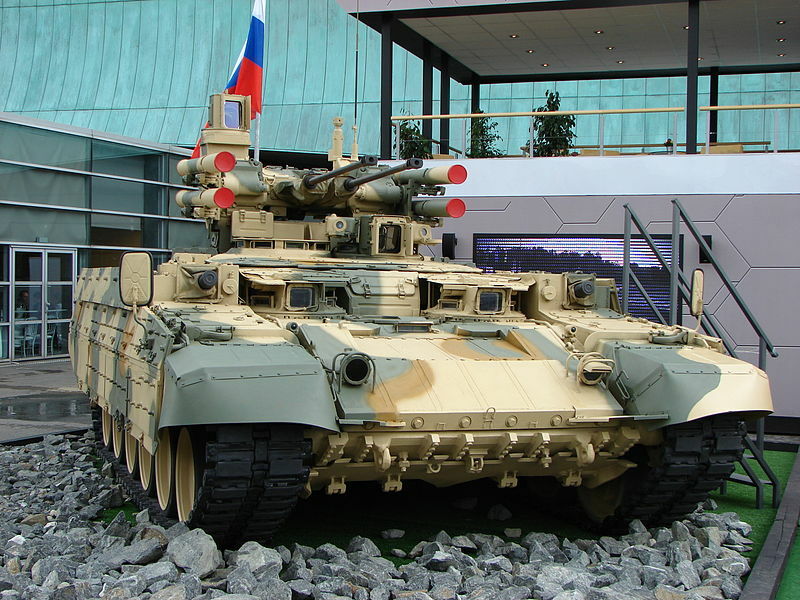 The Russian Federation has however refused the second iteration of the BMPT as well. The reasoning is that since the T-15 Armata exists, there is no reason to adopt the Terminator 2, with possibly less armor and no infantry carrying capacity. Lastly, during India’s DEFEXPO in 2014, UralVagonZavod proposed two upgrades to India’s obsolete T-72s. 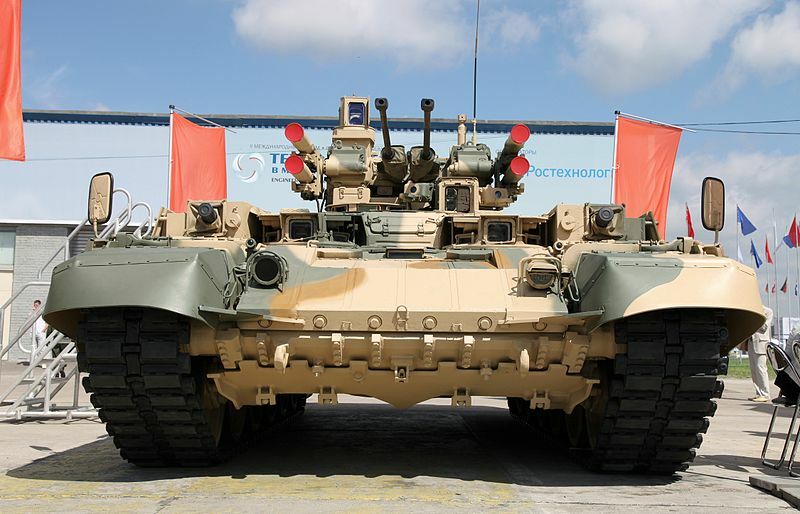 UVZ (UralVagonZavod) proposed the BMPT-72 package on India’s T-72s, which would extend their service life. They also proposed an Arena-E APS upgrade on Indian T-72s. Active Protection Systems fire a small projectile at cumulative and explosive missiles from portable/non-portable anti-tank weapons such as RPGs, Kornet, Konkurs, TOW, etc, detonating them before impact. 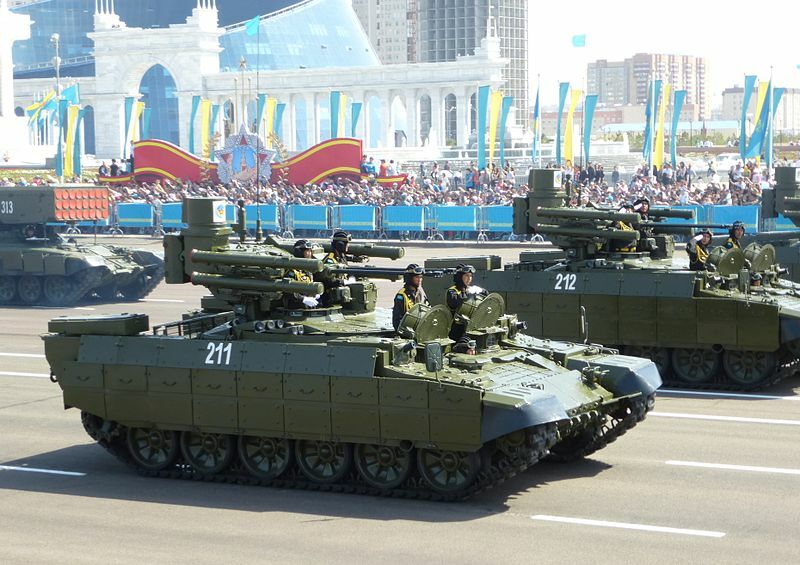 Kazakh BMPT in a parade, 2011. 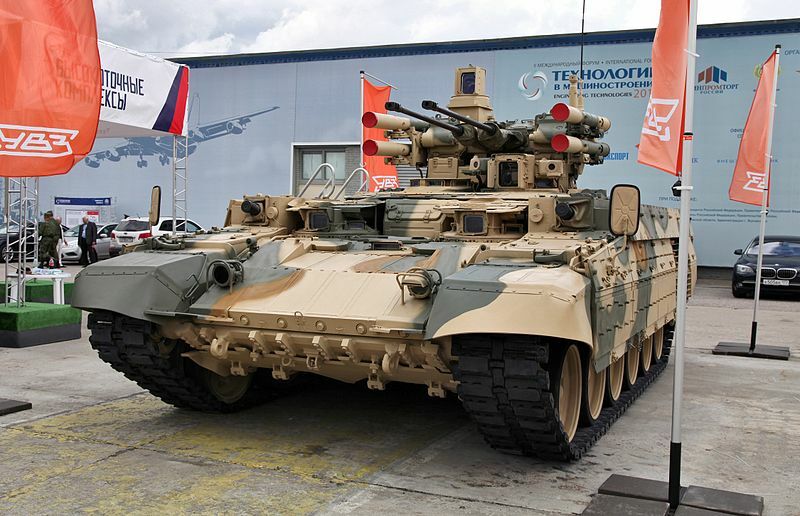 BMPT Terminator at the Engineering Technologies days, 2012. The Terminator as shown at Eurosatory, 2012. So how does Object 787 fit in to all this? There’s a photograph, but no explanation.